There are many hazards on a golf course. Trees encroaching on the fairway. Sand traps. Ponds. Geese. Yes, geese. If that sounds ridiculous, check out the three-photo run shared by Blissfield Athletics out of Blissfield, Michigan. 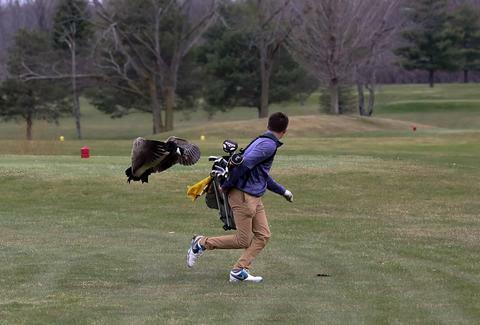 During a high school match, one cranky goose decided he didn't like the look it was getting from Isaac Couling. The goose attacked. Somehow, Devon Pitts, whose husband is an assistant coach for the team, managed to get action shots of the scene. The photos are incredible. According to ABC News, there was a sign on the course warning about the geese. The golfers were respecting their space, staying far from the nest just off the fairway. But then a goose surprised them, coming from the other side. Improbably, one of the best parts of these photos are the explanations from Blissfield Athletics. The tweet raised questions and Blissfield Athletics had answers. One person asked, "How did he get upended?" Blissfield: "He stood up after the 2nd picture and tripped trying to run away resulting in the 3rd picture." Another: "If only he had some sort of metal club that he could wave and protect himself with... [W]here would something like that be found at such a moment?" Blissfield: "The goose [came] from behind him and caught him off guard. He was keeping an eye on another goose at the time." It even responded when people weren't asking questions. "Had to have been hilarious to see the kid running away," said one tweeter. If you're concerned about the well-being of the young man, he's okay. "Just his pride was hurt," according to Blissfield Athletics. He wound up hitting par on the hole.